Yesterday, while watching Malcolm Turnbull’s press conference, I wrote on Twitter that “It's not a big thing but I don’t love this repeated idea that there’s no one more Australian than Barnaby Joyce”. Dastyari returned to the table where he was sitting with people and their pub meals. The men followed him. They continued to parrot: “What race is Islam?” Watts said to the men “What race is dickhead?” Eventually, the men left. The reason we know such detail is not because Dastyari has a photographic memory, but because the men filmed the confrontation, and posted it on the Facebook page of their far-right group Patriot Blue. I strongly recommend watching the video. I had read a number of descriptions of the events beforehand. But watching the video gives you a completely different sense of the situation. It feels horrible. You might know in your head that it ends without violence; watching, you can’t shake off the sense that it still might. There is something visceral about the threat that emanates from a group of men, aiming to provoke, in the middle of a pub. But it’s more than that, too, because the aggression comes with a particular motivation. This is what Dastyari said about the racist abuse: “It makes me feel small, makes me feel horrible, it makes you feel kind of terrible and that’s what they are designed to do.” Again, reading those words, I logically understand the point. But watching the video, you can’t help but put yourself in Dastyari’s place, and feel, if only for the briefest of moments, what that might be like. For some of you, I realise, that won’t be necessary: you’ve experienced plenty of abuse based on who you are. For the rest of us, watching an event like that unfold is illuminating. We are the real Australians. I think you’d call that a consensus position. There is context here. The government is making this point, about Joyce, specifically, because he’s embroiled in the dual citizenship fiasco, and they want to emphasise the idea that this is the High Court’s doing, and nothing to do with anything very real. But that’s not the only reason – it’s because it’s an easy sell, building, in Watts’ words (and remember he said this before the Dastyari incident) on “very old fashioned ideas about what it means to be Australian”. You can tell that from the way Chester finished his sentence: “from the soles of his R.M. William boots right to the top of his Akubra hat”. Of course, it would be facile to blame the prime minister for the stupid aggression of the racist blokes in the pub. The PM rightly condemned it as soon as he was asked, saying there should be “zero tolerance for racist abuse”, that “there is no place for racial vilification in Australia”. But Hanson is the obvious example. When the prime minister and his MPs choose to emphasise, for the purpose of political gain, the “Australianness” of a middle-aged white bloke from the country with a broad Aussie accent, they are shoring up a particular category that excludes vast numbers of Australians. Bill Shorten did the same thing earlier this year with his “Australians first” ad featuring, yep, a gallery of white people (Shorten also condemned the Patriot Blue men in strong terms today). While I was thinking about the Dastyari incident, I read an article in Crikey [$] that considered the long-run political implications of the marriage vote. Veteran LGBTI rights campaigner Rodney Croome made comments that reminded me of my reaction to the video: “Young heterosexual Australians have seen, many for the first time, just how deep anti-LGBTI hate and prejudice can run.” He told the reporter that this understanding would stay with many of them as they later took on other roles, in business, in bureaucracy and in politics. It is a great pity that we need ugly incidents like the Dastyari confrontation, or homophobic abuse under a national spotlight, to make these things clear. And it would be a great pity if we have to wait for the young Australians of today to make their way into politics before we begin to change the casual assumptions many of us make about who is and isn’t a real Australian. 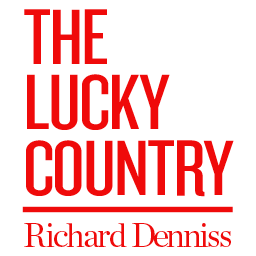 For the final episode in the first season of The Lucky Country, Richard Denniss talks to Jim Stanford about unions and wage stagnation, broadcaster Jeremy Fernandez about shame and speaking up, and Chris Fry about how politics could solve the US gun crisis. Read of the day: James Campbell says businessmen and politics don’t mix. Marriage: Max Chalmers on the lasting political effects [$] of the marriage vote. Coalition debate over the bill. Peter Martin on Scott Morrison’s hopeful catchcry. Citizenship fracas: Is Jacqui Lambie a Scot [$]? Experts say Josh Frydenberg is not Hungarian [$]. David Crowe says we’re looking at a March mini-election[$]. Niki Savva defends Turnbull’s handling [$]. Bernard Keane on the changing leadership equation [$]. “[T]he film suddenly begins to rewind. We see the choppers pushed into the sea during the Fall of Saigon emerge from the waves and back onto aircraft carrier decks, tracers flying back into no-longer smoking barrels, acrid smoke becoming flame and flame shrinking back to the point of impact of shells that return to the bowels of American bombers. We even see Phan Thị Kim Phúc, the famous napalm girl of Nick Ut’s even more famous photograph, running backwards, screaming, up the road to her hamlet.